I joined Tufts International Development (TuftsID) in the Spring of 2016. 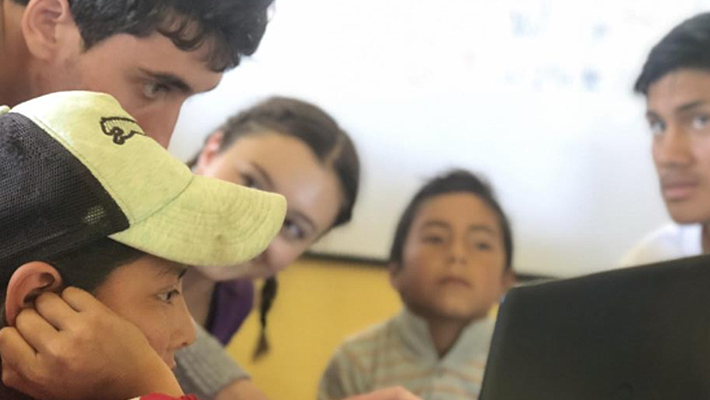 What started out as an idea for digital library centers in rural areas of Ecuador soon became a reality powered through hard work and dedication. In the summer of 2017, we implemented our first “Koombook” digital library in Coaque, an isolated and earthquake-affected region on the coast of Ecuador. The Koombook is an e-library kit composed of a small portable server that uses asynchronous technologies to provide remote and isolated communities access to web-based resources even without Internet access. We implemented the Koombook e-library device with between five and fifteen computers in each of our centers. With this e-library, these communities can easily access thousands of preloaded educational, cultural and training resources in order to strengthen students’ access to education and incentivize their permanence in school (the Koombook holds up to 2 terabytes of information). Thanks to the Davis Projects for Peace, this summer we were able to expand our program to two additional communities outside of Quito: Minas and Jatumpamba. We spent the last few days of our implementation visit opening a third Koombook center in a small community named Jatumpamba, located in the greater Minas area. Jatumpamba’s extreme isolation causes all sorts of problems for community members. In order to attend school, children must take overcrowded vans on unpaved, bumpy roads twice a day. When school is over, and they return to their community, they face limited access to technology and the Internet. These educational challenges discourage school engagement and lead to higher drop-out rates. Limited access to education is an issue that we are committed to addressing with the Koombook Program. With the digital library, kids and adults now have access to laptops and online educational tools. It is equipped with resources like Wikipedia, Khan Academy, 20,000+ books, Ministry of Education textbooks, preparation materials for college entrance exams, and more. The students in Jatumpamba can now do their school work in a facility within the community without having to worry about the cost of traveling to the nearest Internet center, located 40 minutes away by vehicle. We hope that this solution will increase students’ engagement with school work and provide them with the resources they need to achieve their personal and professional goals. By giving children a space dedicated to knowledge, we believe we can encourage small-scale movements that place education at its center. The idea is to spread that sentiment throughout the community to promote education as a more integral part of both students’ and adults’ lives.